Chondroblastoma is a benign tumor of immature cartilage cells which primarily occurs in the epiphysis of long bones in the second decade of life with slight male preponderance. The diagnosis is obtained from the microscopic picture, showing large collections of chondroblasts surrounded by a matrix of immature fibrous tissue and a few scattered giant cells. Benign chondroblastoma is rarely seen in the bones of the feet. Very few cases of benign chondroblastoma involving the talus have been reported. We report an unusual case of benign chondroblastoma of the talus in a 19 year-old female. Clinical presentation, histological diagnosis and treatment by curettage and bone grafting are described. Also importance of intact cortex and approaching the tumor by making a window in the more involved thin cortex is highlighted. The patient is now asymptomatic and there is no evidence of recurrence at 3 years follow-up. 1Assiatant professor, PES institute of medical science and research, Kuppam,AP, India. 2Senior resident, PES institute of medical science and research, Kuppam,AP, India. Its occurrence in small bones is rare. About 12% of all chondroblastoma occur in the bones of the foot. Chondroblastoma in the foot most commonly occurs in subchondral areas of the talus and calcaneal apophysis. In chondroblastoma of the foot and ankle, recurrence is common, and outcomes are generally worse than in other locations in the skeleton. Very few cases of benign chondroblastoma involving the talus have been reported. We report a case of benign chondroblastoma of talus in a 19 year-old female. Clinical presentation, histological diagnosis and treatment by curettage and bone grafting are described along with review of literature. The lesion was approached with a posteromedial incision and by making a cortical window in the medial cortex. The decision was made based on involvement of cortex by the tumor. This has not been described before in the literature. The patient is now asymptomatic and there is no evidence of recurrence at 3 years follow-up. A 19 year-old girl presented with history of pain and swelling in the right ankle since one year. The swelling was insidious in onset and slow in progression associated with mild dull aching pain. Pain increased on walking, and was relieved by rest and analgesics. The patient had no history of trauma or fever. Clinical evaluation revealed that swelling was on the medial aspect of the right ankle and the skin over the swelling was normal. Tenderness was present on deep palpation and there was no local rise of temperature. The swelling was firm-to-hard in consistency and arising from the talus. Range of movement of the ankle and subtalar joint were restricted and painful. There were no distal neurovascular deficits. No appreciable lymphadenopathy was noted. Conventional radiographs showed well-defined, expansile and lucent area within talus involving the body and posterior subchondral area. The lesion was approximately 3.5cms in size. There was no breach in the cortex. Most of the talus was involved except the lateral cortex head. The medial cortex was thinner than the lateral cortex. Stippled calcification with thin trabeculae was seen within the radiolucent area (Fig. 1). Based on clinical and radiological findings, a diagnosis of benign cystic lesion of the right talus was made and aneurismal bone cyst, chondroblastoma were considered for differential diagnosis. An open biopsy, curettage and bone grafting was performed. The lesion was approached by a posteromedial incision. The decision of approaching the lesion by a posteromedial incision was made based on the extent of involvement of the cortex. A window was made in the medial cortex of talus. Extensive intralesional curettage was performed. The defect was then filled in by bone graft harvested from the iliac crest and bone substitutes. Microscopic examination of the tissue revealed sheets of cells with oval to elongated nuclei. Scattered osteoclastic giant cells were present. Isolated island of cartilaginous matrix with focal area of linear calcification (chicken wire calcification) were seen and a diagnosis of chondroblastoma was made. Post operatively below knee cast was applied for two months. The patient was started on partial weight bearing walking after 2 months and full weight bearing walking after 3 months. Figure 3 Two year Post operative radiograph showing satisfactory incorporation of bone graft. Chondroblastoma is benign cartilaginous tumor which has typical clinical pathological features. It accounts for one percent of all benign tumors. [8,9,10,11,12] Chondroblastoma has been seen in people of all age groups. Adults in their second decade of life appear to have a higher prevalence of the tumor. A study of 104 cases by Bloem and Mulder revealed an average age of 16 years in tumors affecting long bones and 28 years in short, tubular bones, most notably the talus and calcaneum. Males are affected more than females by approximately 2:1 rate. The tumor is characteristically centred in the epiphysis of long bones. Chondroblastoma is a benign tumor but occasionally the tumor may show a more aggressive pattern, with invasion of the joint spaces, adjacent bones, and very rarely, the metastases. 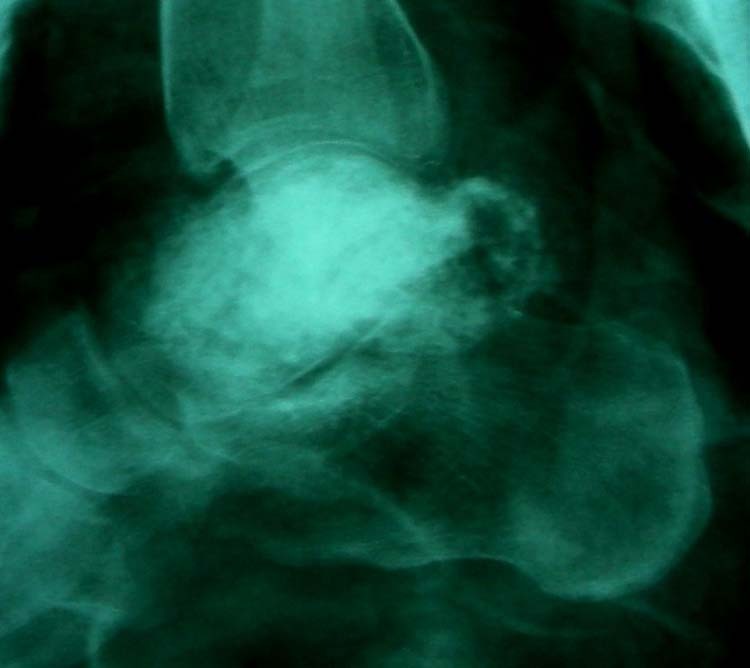 Typically on a radiograph a chondroblastoma presents with an eccentrically or centrally located osteolytic lesion that involves the epiphysis or other secondary ossification centers. In 20% to 25% of the cases metaphyseal involvement is also seen. Cortical expansion, with erosion and periosteal reaction may be present occasionally. There may be stippled calcification or there may be no matrix mineralization. The tumor is adjacent to an articular surface or an apophysis. Extension of the tumor to the articular surface had been observed. Computerized tomography (CT) scans can provide valuable information in helping diagnose and evaluate the extent of a chondroblastoma. The size of the lesion can be better appreciated with CT scans as compared to plain radiographs. CT scan is useful for defining the relationship of the tumor to the joint, the integrity of the underlying bone, and to identify intralesional calcifications. Also, the amount of calcification can be better evaluated. Magnetic resonance imaging (MRI) can help in the diagnosis and in the differentiation of a chondroblastoma. MRI is especially useful when plain radiographic findings are inconclusive. MRI scans show the very high signal intensity on T2 weighted scans. Bone scan shows avid tracer uptake in the lesion. In MRI scan surrounding bone marrow and soft tissue edema and periosteal reactions may be seen. Nuclear scans have shown that chondroblastoma are more hyperemic than the surrounding bone but are nonspecific for actually diagnosing a chondroblastoma. The tumor is composed of cellular and matrix rich areas. Tumor cells are round or polygonal cells with an oval or round nucleus and eosinophilic cytoplasm make up the cellular areas. The nuclei are often indented and lobulated. In non-decalcified sections the chondroblasts appear focally delimited by a thin calcification rim, so called chicken wire. Mitosis is always typical and is quite frequent in the cellular areas. Matrix rich areas are composed of different types of matrix like chondroid, osteoid, fibrous and rarely mature hyaline cartilage. Of all the bone tumors, chondroblastoma represents less than 1% with only 20% of it occurring in the foot. Chondroblastoma of foot is most commonly found in the talus and calcaneum. [10,11,18,16,19] Approximately 4% of all chondroblastoma arise in the talus. [5,14,20] Very few cases of chondroblastoma involving the talus have been reported. 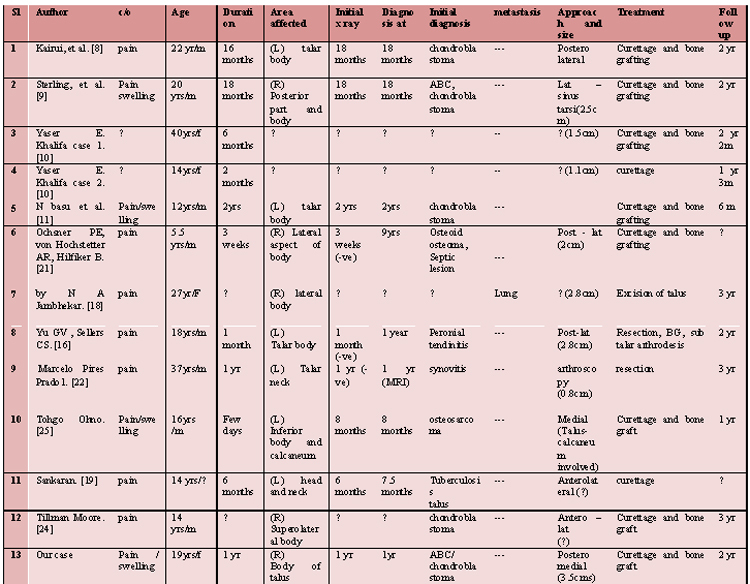 Table 1 Chondroblastoma of the talus, a review of cases. The clinical data of 12 reported cases and our case are summarized in Table 1. The average age at presentation was 19 years. Three patients presented in the first decade, five patients were between 10 and 20 years and 5 patients were above 20 years. Males are affected more than females by approximately 2:1 rate which is comparable with other large series reported by Ramappa, et al.,. Out of 13 cases reviewed here, the talar body was involved in 11 patients and the talar neck was involved in two patients (table 1). In the majority of the patients the left side of the talus was involved. Patients often present with pain and swelling around the joint. 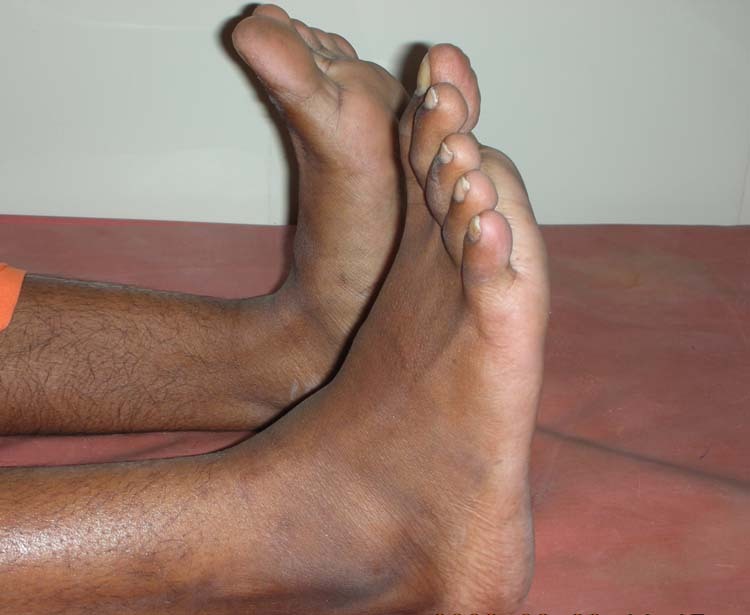 Chondroblastoma is known to present with atypical features when the foot is involved. Involvement of the talus can present with pain in the ankle joint more commonly. Approximately 20-50% of the patients give a history of trauma. All of the patients reported with chondroblastoma of talus presented with pain and most of them had swelling (table 1). Most of the patients had pain for several months before presentation. The case reported here had pain in ankle one year before presentation. Localized swelling and a decreased range of motion are common clinical findings, with the majority of patients having tenderness on direct palpation. 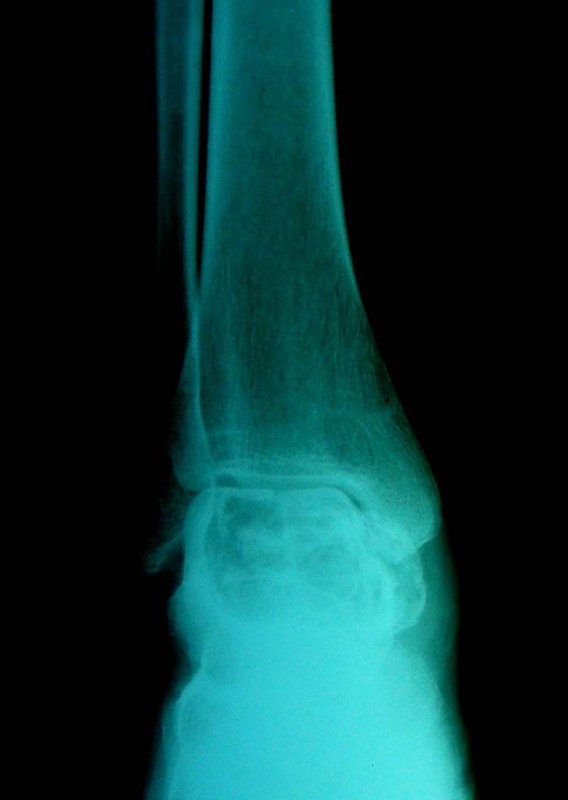 Rarely pathological fracture is the presenting feature in about 1-13% of patients. Since chondroblastoma is not common in the talus, patients presented early with complaint of pain are misdiagnosed. [21,16] Two patients presented within one month after pain in ankle had normal radiograph initially (table 1). Both of these patients were misdiagnosed at early presentation. Chondroblastoma was diagnosed when a radiograph taken after few years showed the lesion. One case presented at one year with pain in the ankle, radiograph showed no significant changes, but MRI revealed the lesion in talus. Because of this atypical presentation chondroblastoma of the talus may be confused with synovitis, tendinitis or other lytic lesions of bone like aneurismal bone cyst, tuberculosis. The diagnosis of these lesions, in uncommon sites, is often delayed for months or even years, and are often treated as ankle sprains. Metastasis of benign chondroblastoma is a rare event. Benign pulmonary metastases have been reported with primary tumor involving the talus and the author concluded that all patients need to be evaluated regularly from the onset for possible lung metastasis so that deposits can be detected early for total resection. Curettage and bone grafting has shown good out come when articular surface is not involved. Total talectomy may be contemplated in cases where there is extensive involvement of the talus. The recurrence rate of chondroblastoma is reported to be 10 % to 15 %. Open growth plates have also been considered as a risk factor for recurrence. Springfield., et al. in their review of 70 cases of chondroblastoma, have suggested that recurrence is secondary to less aggressive surgical curettage due to fear of injury of the physis. While in a review of 73 cases of chondroblastoma by Ramapa., et al. treated between 1977 and 1998 , it is concluded that one possible explanation of recurrence of chondroblastoma in their case might be the anatomic location. Also lower recurrence rate is found in patients treated by packing the defect with polymethylmethacrylate instead of bone graft. Bloem, et al., in their study of 104 chondroblastoma cases have follow up exceeding 3 years, but they failed to see any recurrences after this period. 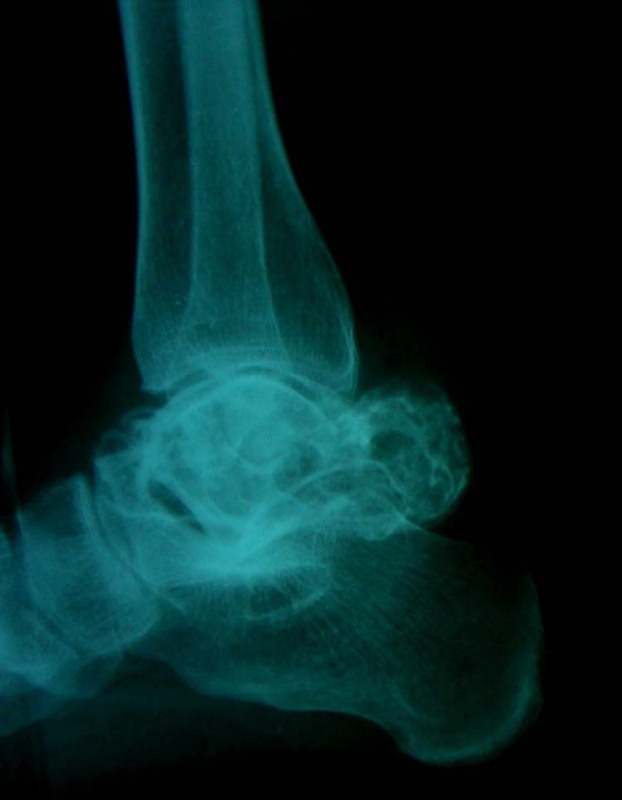 In chondroblastoma of the foot and ankle, recurrence is common, and outcomes are generally worse than in other locations in the skeleton. Recurrent lesions should be treated with repeat curettage. Recurrence and severe destruction of bone integrity may necessitate ankle arthrodesis or en-bloc resection with associated functional loss. Patients with recurrent lesions should have follow-up CT scans of the chest to detect pulmonary nodules and if present nodules should be excised. In our case, the lesion was large measuring approximately 3.5cms. Most of talus was involved except the lateral cortex and head. The articular surface and all cortices were intact. Hence, we planned for curettage and packing the cavity with bone graft. The lateral cortex was thick as compared to the medial cortex. Hence, we have decided to approach the tumor by the postero-medial approach. Since the lateral cortex was thick approaching laterally and making a window in the lateral cortex would have weakened it. Yu and Sellars used a lateral incision with direct curettage near the opening of the sinus tarsi, and gained access to the lesion through this approach. Wu concluded that eccentrically based talar chondroblastoma should be treated with talectomy. Sterling described approaching the lesion without entering the cavity of the adjacent joint via the sinus tarsi. Small-sized tumors can effectively be curetted through arthroscopic portals with minimal morbidity. Anderson reported small chondroblastoma of the talus involving articular surface treated with osteochondral autograft transfer. For best surgical results with minimal morbidity, there should be early diagnosis and proper choice of the best surgical procedure. The case reported here utilizes a comprehensive approach which decided on the extent of the lesion involving the talus. We believe that the surgical approach should be decided on the location of the lesion, articular cartilage involvement and also on involvement of the medial or lateral cortex for maximum restoration of function. Chondroblastoma of the talus is a rare condition and it should be considered in the differential diagnosis in lytic lesion of the talus. A thorough history, physical examination and proper radiographic studies is mandatory. Diagnosis is confirmed by imaging study supplemented with open biopsy. The surgical technique and exposure of the tumor are modified to suit the requirements in each ease. Properly performed extensive curettage and bone grafting is a good option for complete removal of tumor. 1. Rosai J. Ackerman’s Surgical Pathology. 7th Edition, St Louis, CV Mosby, Chapter 24, 1989; Vol 2. 6. Simon MA Springfield, D. S: Surgery for Bone and Soft Tissue Tumors. Philidelphia, Lippincott-Raven; 1998: 190-191. 12. Dahlin DC, Ivins JC: Benign Chondroblastoma. A study of 125 cases. Cancer 1972 30: 401-413. 13.Bloem JL, Mulder JD. Chondroblastoma: A clinical and radiological study of 104 cases. Skeletal Radiol 1985 14: 1-9. 18. Jambhekar NA, Desai PB, Chitale DA, Patil P, Arya S. Benign metastasizing chondroblastoma. Cancer 1998 82: 675-678. 19. Sankaran B, Duggal K., Wani GM. Chondroblastoma of talus – A case report. Indian journal of orthopaedics 1979 13 :81-83. This entry was posted in Uncategorized and tagged bone graft, Chondroblastoma, curettage. Bookmark the permalink.